Whenever I am in Portland, I make sure that I book a massage with Zorina. I love the infrared sauna and massage combo. She is truly an expert at what she does. And such a wonderful, warm energy she gives. I highly recommend trying out a session with Zorina! I highly recommend Zorina! She’s warm, caring, and sincerely interested in helping me feel better. I’ve had a hard time finding someone to work on and make progress with a specific challenging issue I have with scar tissue around some ribs. Zorina listened well, was very thoughtful about her approach, and addressed my pain in a gentle and effective way. Thank you! Intuitive, warm, welcoming, thoughtful, TALENTED -- consistently provides some of the best massages I've ever had. We're from the midwest, but whenever we're in Oregon, I make it a point to have Zorina work out the kinks. She’s the BEST AROUND!!! I’ll keep coming!!! I had my shoulder replaced and she helped me so that I could lift it up again. Any sciatica pain I have had, no more. I highly recommend Zorina!! As I said, she’s the BEST AROUND!!! Zorina is one of the best massage therapists in Oregon. She is skilled beyond words and has helped me through several surgeries. She is an ongoing part of my overall health and I recommend her highly to you. Give her a call, you will be glad you did. 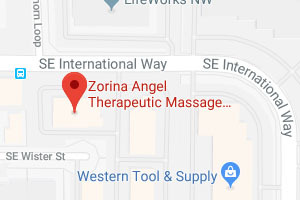 Zorina Angel is a Licensed Massage Therapist in private practice located at 4040 SE International Way Suite E206 Milwaukie OR in Milwaukie Business Park just minutes from I-205 and Hwy 224. She is a devoted wife, mother of four with two in college, and has three beautiful grandchildren. After eleven years of being in private practice she is still dedicated to learning and incorporating what she has learned along the way to best benefit her clients. She is currently studying another modality called Spontaneous Muscle Release Technique (SMRT) developed by Dawn Lewis in Colorado. Zorina feels that immersing herself in constant continuing education is critical to be able to provide the best care to her clients. In August of 2018 her loving and supportive husband surprised her with a far infrared sauna that she is now adding to her list of services as an added benefit to her clients.